Watch the film and find out how you can help refugees. Use our simulation activity in school to deepen understanding. Together we have walked more than four times around the world to Share the Journey with refugees. Thank you! Share our animation to raise awareness of the new global agreements on refugees and migration signed in December 2018. Can't use Youtube? Download the Refugee animation. A guide and script to help you organise your walk. Log your miles and celebrate! Record your mileage on our online totaliser and download your certificate to celebrate. Your class can use this poster to raise funds for the World Gift, 'Emergency Shelter'. Downloadable pdf of the Share the Journey cards. The global compacts have now been signed, so the petition section of these cards should no longer be used. But please continue to walk in solidarity with refugees. 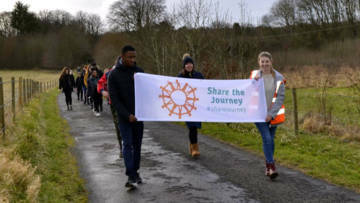 Information about how you can join the Share the Journey walk. 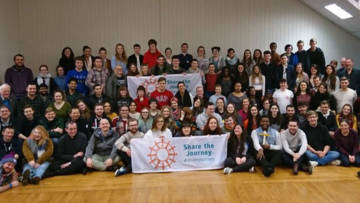 On the move invites young people to follow a refugee family on their journey to safety.